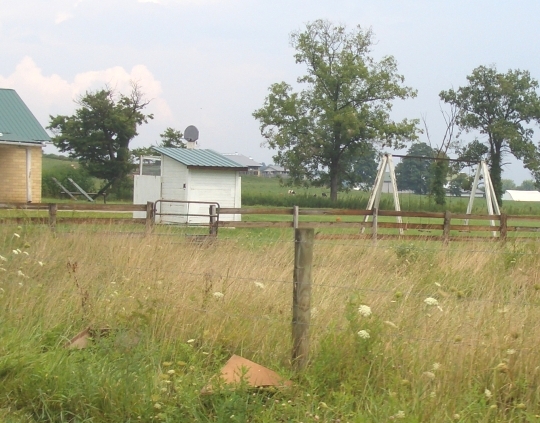 It is fascinating to see how the Amish embrace some technology and abandon the rest. Beautiful photos! Such beautiful pictures! Do you find going there to be like a spiritual retreat? 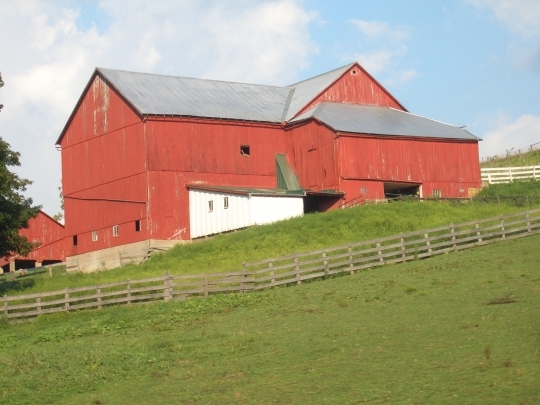 Just looking at your photo of the red barn makes me feel peaceful. Thanks! Beautiful pictures, Erik. 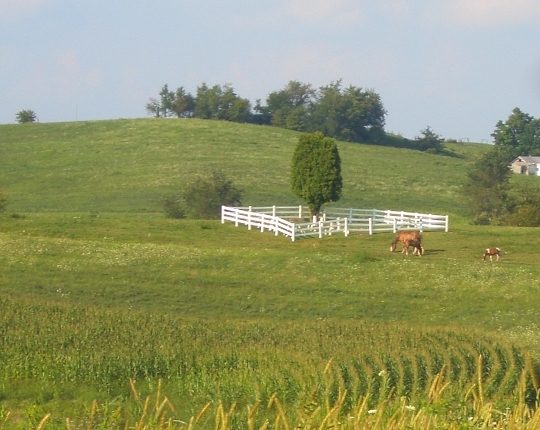 I love to go to Holmes County for visits as it is so peaceful there and relaxing and the folks are very friendly. Hope you are having a wonderful trip! I went to see the Pennsylvania Amish when I was young, I don’t remember much about it, but…I do remember a large coloring book my dad bought me, it had pictures of Amish men, women, and children as well as their homes. 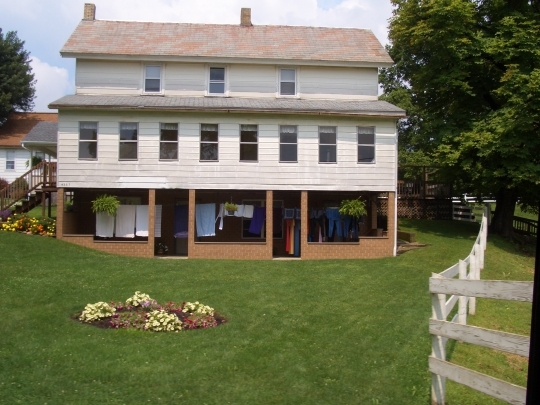 Now that I am looking at pictures of Amish homes, I really don’t see that they look different than any other home. But…the area they live in seems so peaceful, makes you want to be there. I’m trying to figure out if it’s New Bedford, Baltic, or Charm where these pictures are from….& I know is that it looks like home to me. the guy weed eating is close to Farmerstown on TR 184, then another one is on TR 182 where Beachys Nylon Harness is at!The buggy one comes from the corner of SR 557 and 643! We’ve had “Picture perfect” weather the last week! 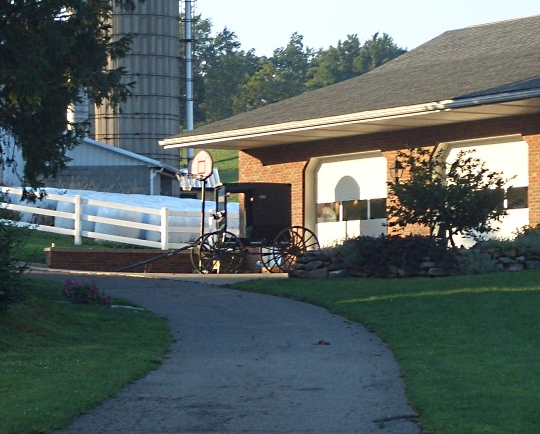 For a better part of the evening yesterday, I whined to my husband that I was in need of some “Amish” time…translation…I need to go to Berlin Ohio (and surrounding areas). Upon logging into my FB account, look what was one of the first on my news feeds…. Beautiful pictures of the place I find peace! I know exactly the places that these were taken!! I believe this was my sign from God. Or should I rephrase.. This was my husband’s sign from God…ha ha. Guess who will be packed and ready to go before that man even wakes up this morning?! It’s so fun to read all of the comments – I must live very close to some of you! It’s so fun to read all of the comments – I must live pretty close to some of you! Soon we’ll be back there again, although we’ll be just across the line in Knox Co. It’s so peaceful there, and we make it more so by not taking a laptop (don’t have one anyway) or cellphone (won’t work at cabin.) Your lovely pictures make me want to return even sooner. Enjoy your time in Ohio Erik. I love the photos, talking about visiting the area around Labor Day! Cannot wait for the peaceful, nostalgia!!! The photos are great Erik. Thanks for sharing them with us. I think the countryside and the farms are just so beautiful. You captured the uniqueness and simplicity of these remarkable people. Beautiful photos. The country is the only place to find peace and comfort. 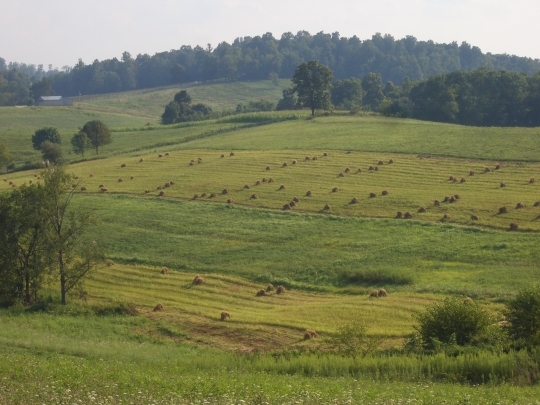 I miss the rolling hills and the smell of fresh cut hay. The homes in these photos look much different than the homes in MN and Iowa. But very much like the ones I saw in Lancaster. Give us some more beautiful photos! Your pictures are lovely. Thank you for sharing. 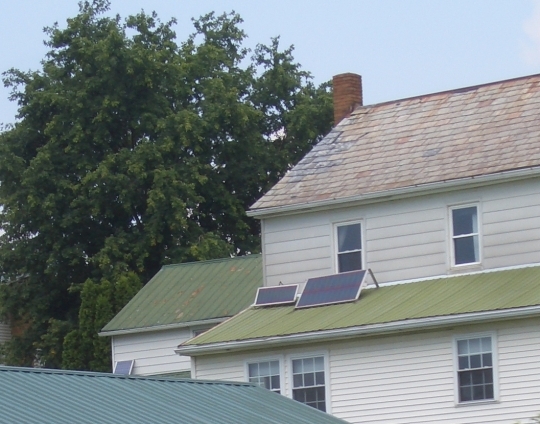 I am loving the solar panels – looks like the Amish are ahead of the curve on this one. I am surprised the Ordnung allows the use of solar panels. Perhaps it is because they are used in the barm and not the home. I have seen Old Order’s using LED flashlights in their homes, but not solar panels. Nice pictures Erik! Pam, I know the feeling of needing some “Amish” time well….I call it needing my”Amish Fix”. this morning I went on a peaceful trip of my own. photos. I promise I’ll be first in line to buy it. Loretta, I travel to Roxboro, NC every year. 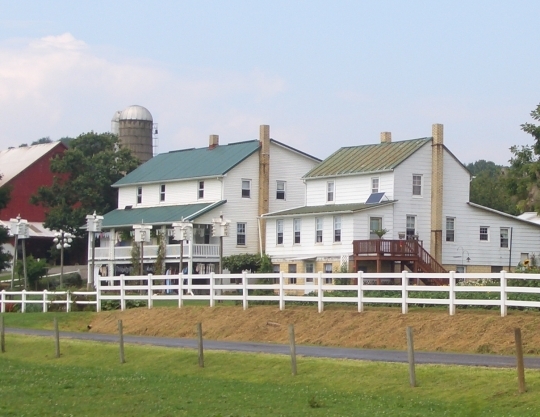 When I go in Sept, will visit the Halifax, Va Amish community. Until recently I had no idea Amish were there. I can’t get enough of these photos! Viewing them is like taking a “chill pill”—calms the nerves. I can’t help but wonder just what the solar panels “operate”—lights? Something else? I’d love to know for certain. I got to thinking about all of those storm chaser vacations I’ve heard about. Erik, you could probably make a mint with an Amish tour (small ones—a few people at a time). You’d certainly have a “captive audience,” if your blog is any indication! I’d certainly go (maybe you could drop me off in Bedford where my pen pal of 45 years lives—we’ve never “met”). Godspeed & enjoy every minute! Just outside Mrs Yoder’s Kitchen ( in Mt. Hope ) on the corner where the bank is, there is a bench where you can sit for hours and just watch the Amish go by in all types of vehicles from pony carts, open and closed buggies, animal hauling wagons, tractors, and lots of these strange looking, real tall bicycles that they use. That intersection is a main hub, with town businesses like the bank, post office, hardware store, health food store, fabric store, and a convience store all right there, as well as the popular Mt. Hope Auction, so that’s why it draws so many local Amish. 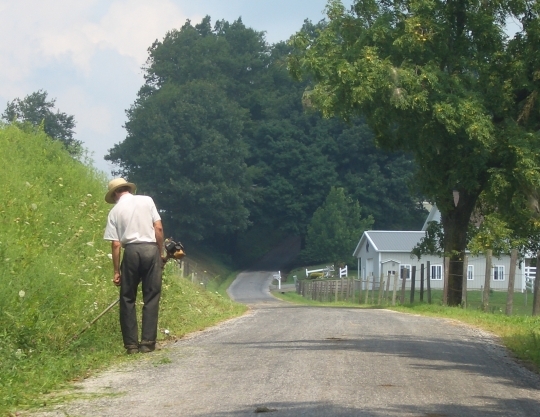 You’re making me envious, Erik, as that whole area out there is so neat and peaceful, especially all the rolling backroads amongst the Amish farms. BTW, in the photo with the two white houses sitting next to each other, is the bottom floors at ground level the basements? Just curious as per an earlier post about them. It’s so fun to read these comments – I must live pretty close to some of you! Rich (post up above), I live about a mile from the Wilderness Center and know who “Triple Mose” is – just up the road a bit! Do I see a satellite antenna on the outhouse?? in the picture of the school yard?? It does look kind of like that Tom, but kerry and Alice Mary are right–it is a basketball hoop. It just got caught at the right angle in the photo to look like it’s growing out of the outhouse. The b-ball hoop is pretty standard at many of the Holmes County schools. 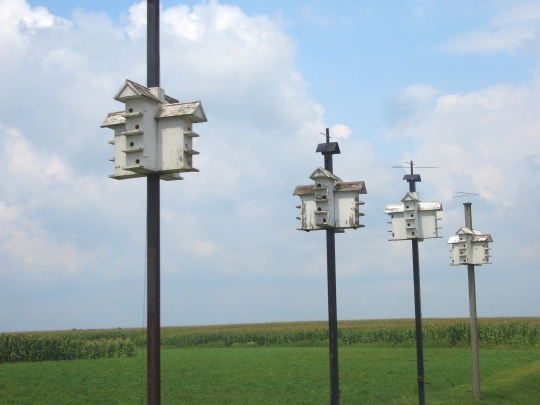 Not to mention at Amish homes–there seem to be more and more of them every time I am here–and some pretty nice ones to boot! Tom, I think it’s a basketball backboard, rising above & beyond the roof of the outhouse. I think that’s a basketball hoop. Several schools around here have them, although it’s not commonly seen. It’s after 1 am, but I wanted to at least share something–I just returned from a front-yard cook out dinner with friends, way off in one of the distant corners of the settlement. It was quite a nice evening (warm at first, cooled down as the sun set) and things stretched out pretty late. We had three fires going, grilled cheese-stuffed hot dogs, cooked kettle beans, and had baked cabbage. Plus roasted marshmallows, ice cream, and of course good conversation under the stars. Can’t beat that. Oh, these pictures make me homesick – my family is there!!!!!! Just love to visit once a year and wish I could live there!!!!! So relaxing and so beautiful!!!!!! Great pix as always, just love those red barns! Great pics……sorry I missed you in Berlin. and no place matches our culture….we thank God everyday. Erick, please hurry back and do another book signing. During you travels and photo shoots did you come across any of the horrific puppy mills that exist in Holmes County? Good use of space, isn’t it. I have two disappoints with the pics. Thanks for sharing these great pictures….I want to go there….I wonder how far it is from me, I live in Ohio too ? I am visiting at my son’s in Florida, and yesterday he took me to Sarasota….what a lovely city…I was hoping to see Sherry Gore, but did not….we ate dinner at “YODERS” in Pinecrest she talks a lot about this restaurant, did get to speak to one of the Amish ladies who worked there, she said her mom knew Sherry very well…,we had their peanut butter pie and picked up some Whoopie pies (choc. w/cream) and pumpkin bread, had it for breakfast this morn. very good….still haven’t tried the Shoofly pie yet…..they said it is very sweet…..does anyone know what it taste like ???? Is it similiar to a pecan pie ???? ?